Gamification origins in sports and games. With rewards and competition, users will be motivated to achieve better performance. Among videogames, a lot of other applications using the principle and the dynamics of gamification. Examples are mobile sports apps and intranets. The only requirement is the existence of metrics, which are used for evaluation. In case of a sports app this might be the covered distance of a jogger, or in case of a company this might be the amount of sales. Gamification also offers the possibility to create a variety of statistics regarding user-efficiency and behaviour. Inside companies, Gamification can cause a huge increase of motivation among employees and customers, leading to a global company performance boost, without the need to recruit additional staff. The basis of our services is the Gamification-Engine, developed by ourselves. We offer a full package of services in order to integrate Gamification into your product or company. 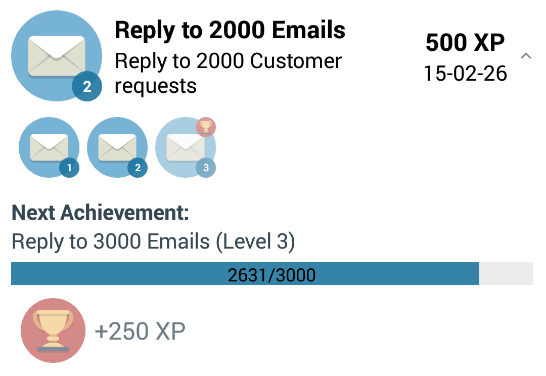 How can Gamification improve your product or company? What advantages can you expect by using gamification mechanics? In which areas does gamification not make sense? Gamification is a superordinate term for different elements: virtual achievements, rewards and competition between others. The choice of elements together with the definition of suitable metrics and analyses is important to achieve a positive effect using Gamification. In worst case a wrong choice can also cause negative effects. The defined metrics will be formally defined in our Gamification-Engine, and integrated into your products. This is necessary, because events of users have to be tracked. Examples are CRM-Systems, games or time-tracking systems. The Gamification-Engine can be used as Software-as-a-Service (Gamification SaaS), or hosted on your own private servers. We take care of the entire maintenance of your Gamification-Engine, adopt or implement new interfaces according to your infrastructure. This can be offered in case of Software-as-a-Service, as well if hosted on your own servers. 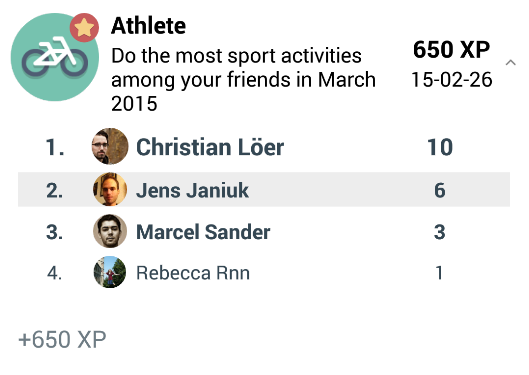 Reachable achievements motivate users to become more active. Rewards positively encourage users for their actions. This leads to more contentment within your company. Casual ladders cause ambition without applying pressure. Levels are benchmarks for experience and specialization in certain fields. All texts can be defined in any language. Dynamic rules and a flexible architecture make various applications possible. Dependencies allow the definition of sub goals. Time-based rules allow daily, weekly, monthly and yearly achievements among time zones. It is possible to restrict ladders and achievements to specific locations, for example a ladder containing only users of a specific city. Rules can be defined based on social relationships and groups. The software architecture is designed to handle a huge amount of users and requests. The Gamification-Engine can only communicate with relevant systems. In case of SaaS we host your engine on secured servers in Germany. We publish the Gamification Engine as open source software to encourage other developers to develop more features and improve the engine together with the community. The Gamification-Engine is available as open-source software at GitHub and can be extended by anyone. We look forward to your pull requests and interesting discussions. Anyone may use the Gamification Engine for any kind of use. The only request is to contribute all changes and improvements back to the community. The documentation contains detailed information about the installation and the concepts of the engine. Multiple subgoals can be defined for a single achievement. 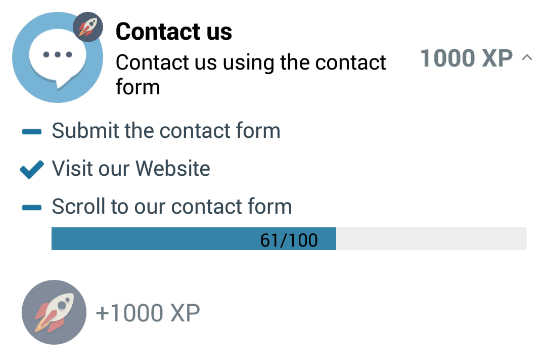 Progress bars create an ever-increasing desire to accomplish the defined goal. Level-Achievements provide new motives to improve and prove itself. By comparing own results with others, the user is motivated to become more active and to achieve a better performance. Comparisons can be applied globally, between friends, between colleagues, or based on locations. All texts can be defined in multiple languages. Get a consultation without any obligation. A service of the ActiDoo GmbH.